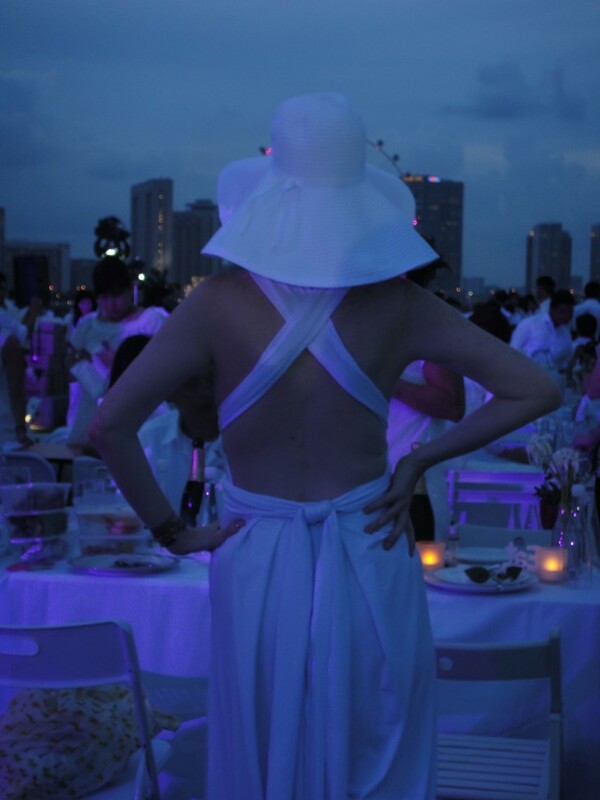 Last year’s Diner en Blanc was Singapore’s first and all I remember hearing about was the almighty backlash that erupted when organisers banned people from bringing local food along (namely tau fu fa/beancurd) to eat at this all-white, touring global ‘picnic’, for want of a better word. 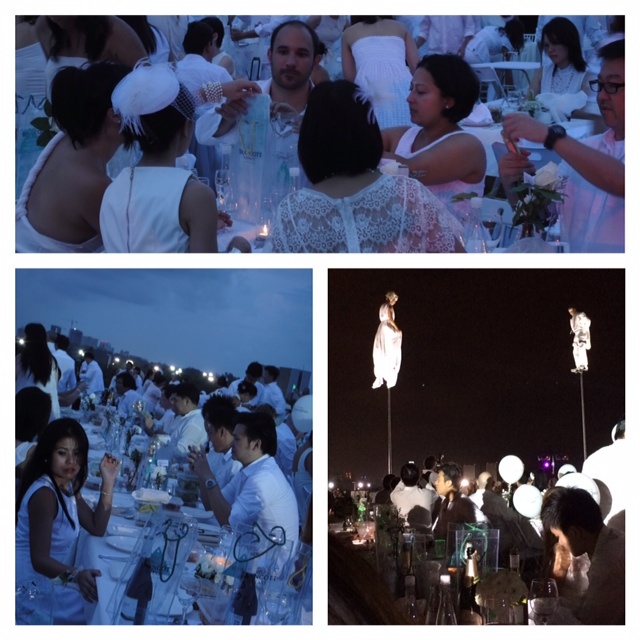 This year’s Diner en Blanc took place last Friday. 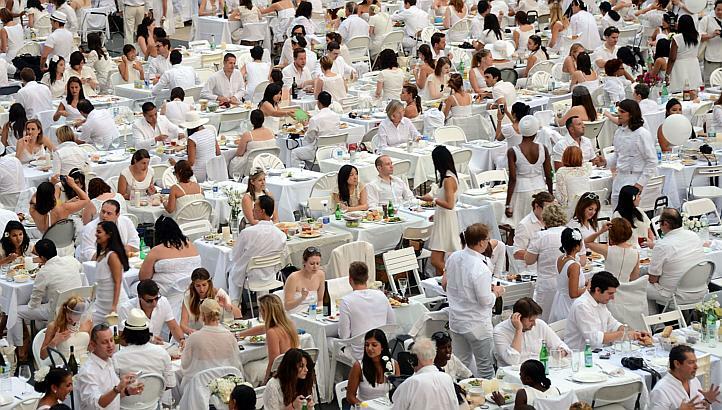 I was invited by the sponsors, Perrier-Jouet, and was hugely relived to find that the rules over food had been relaxed; you could bring anything you wanted and no, it didn’t have to be white. Clothes most definitely DID though. Just before I cut out two eye holes in a white sheet, my beautiful friend Fi – who has just moved from Singapore to Saint-Tropez…as you do – saved the day. 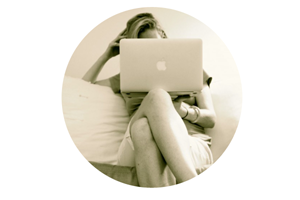 Fiona happens to design jumpsuits under the brand she has just launched and so well personifies: Global Babe. No ordinary jumpsuits, these were two years in the making, can be tied 12 different ways and are currently selling like hotcakes from her little shop in the Saint-Tropez market as well as online and at a few choice Singapore stores. I wore it with one of her white floppy sunhats that I stuffed into the washing machine to clean up (yup, all her clothes and hats are machine washable; hats can even be ironed) and some Kenneth Jay Lane earrings from Pinwheel Jewels which I wrote about before here. 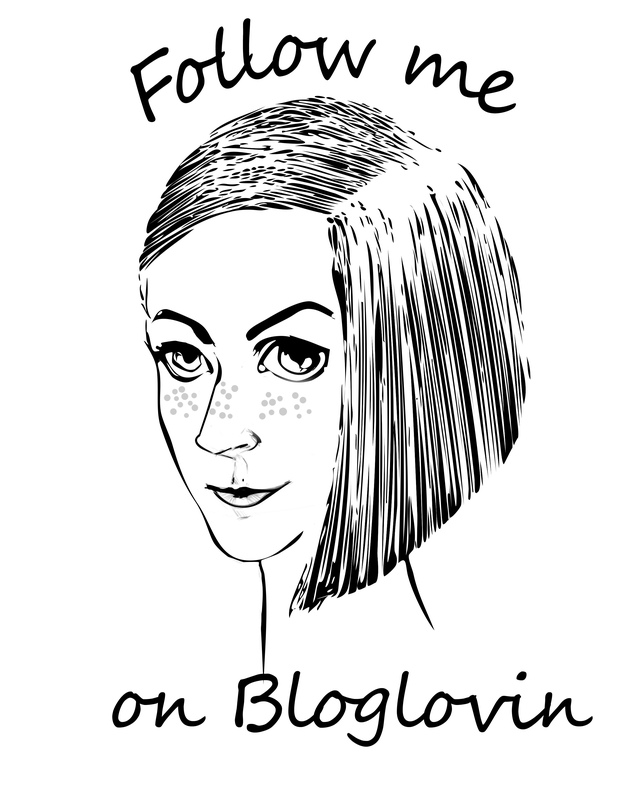 Global Babe is in fact running a special offer for all Changmoh readers – see end of post for details. 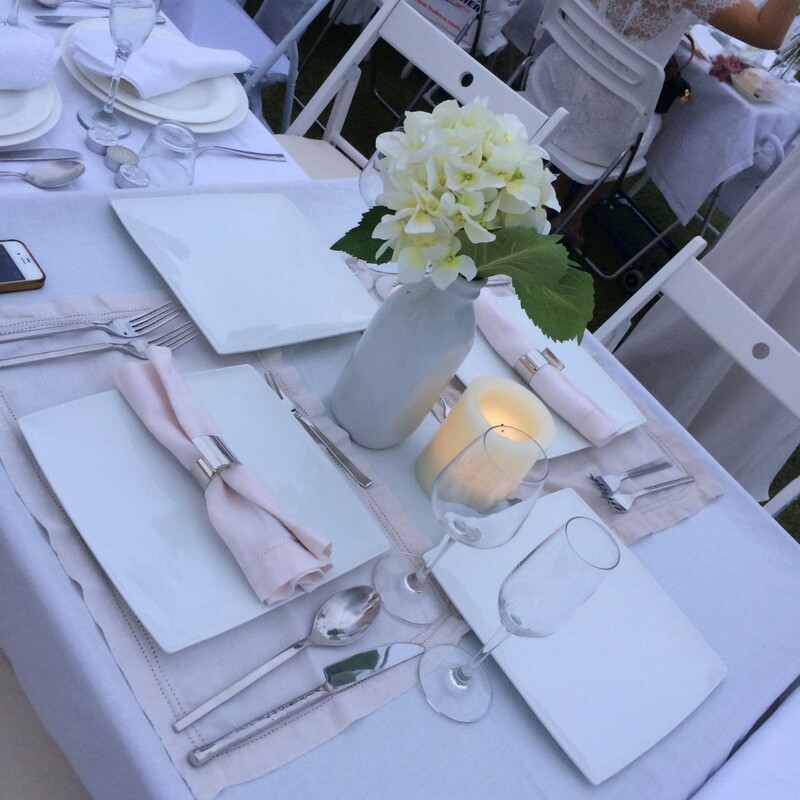 As you have to lug all your food, plus a small table, two chairs, china plates and proper glass glasses to the secret Diner en Blanc location that they don’t reveal until you get there, it’s all rather hot work. 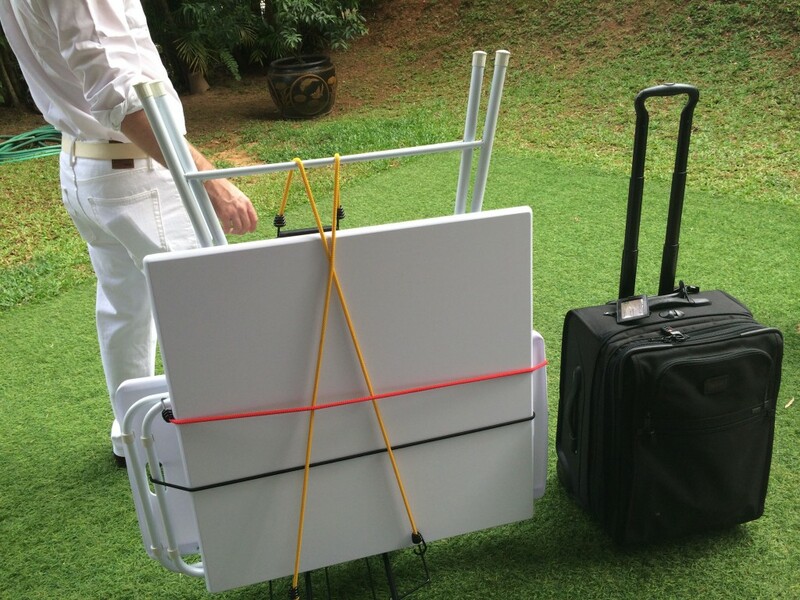 I managed to find one of those usually rather questionable luggage trolleys from the one place in Singapore that’s actually open at 9am and where you can buy almost anything (well, except a Global Babe jumpsuit I suppose). Yes, good old Mustafa. Here’s all our gear plus an illegally coloured wheelie concealing a cool bag, plates and more. 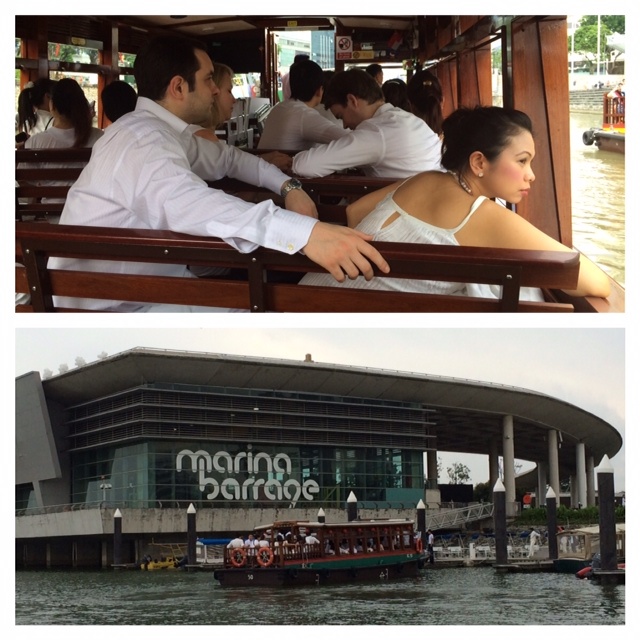 A fleet of boats picked up a huge group of us at 5.30pm from Clarke Quay and ferried us to Marina Barrage, this year’s venue with really quite spectacular views of the city. Boats are such a lovely way to travel, I always forget how much I like being on the water (some people got assigned the bus, we were lucky). 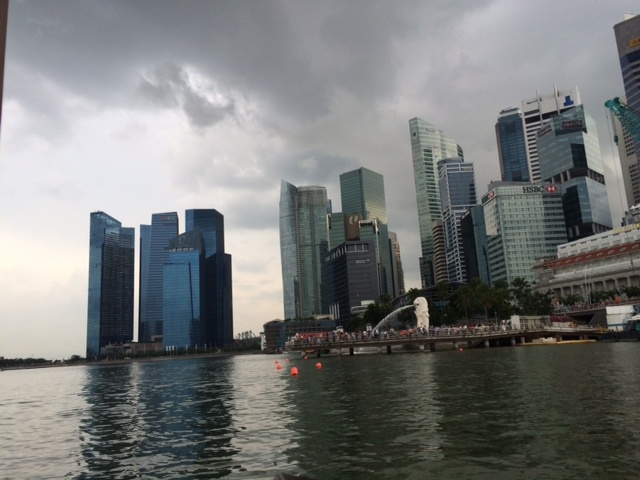 By some miracle it didn’t rain and it was a different way of seeing a city I know so well. The Art Science Centre looked close enough to touch and I’m sure I’ve never noticed the three jumping statues outside the Fullerton before (bottom right in the picture above). I can only assume they’ve just been given the bill for a round of cappuccinos at the terrace restaurant there which is eye wateringly expensive. Our table was very spartan in comparison to our neighbour’s effort below – damn you EK! There was a sponsor’s guests seating plan but it all got rather lost in translation and we ended up sitting with friends which was miles nicer. …as well as the dancing acrobats on sticks who soared above the crowd. 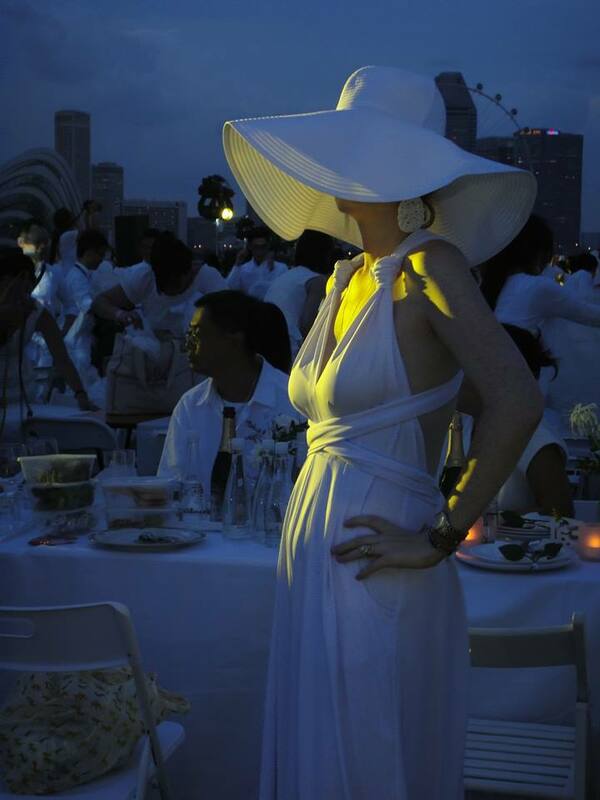 Fi is offering the first ten Changmoh readers who place an order at Global Babe a free floppy sunhat – worth S$90/£45. Just mention Changmoh in the “Add comments about your order” section. My jumpsuit and floppy hat were gifted by Global Babe. Congratulations on an amazing article. Serious nautical chic with the bateaus and you do it all so well in white. 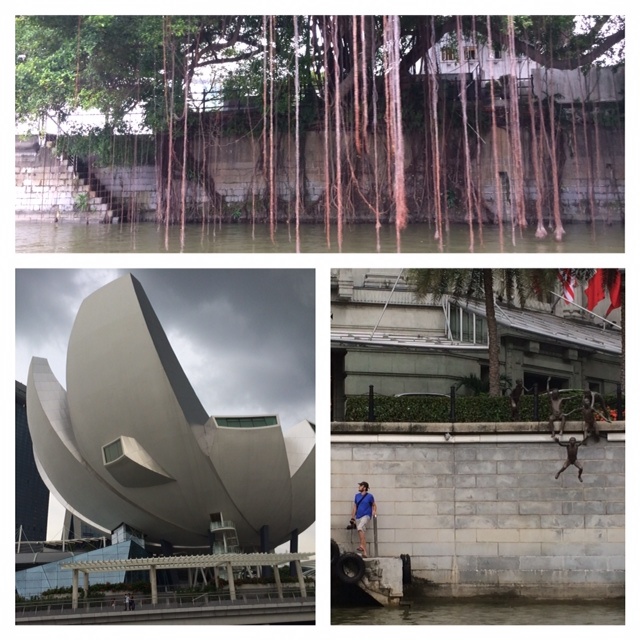 Love the final shot and the musings of an English girl in Singapore. 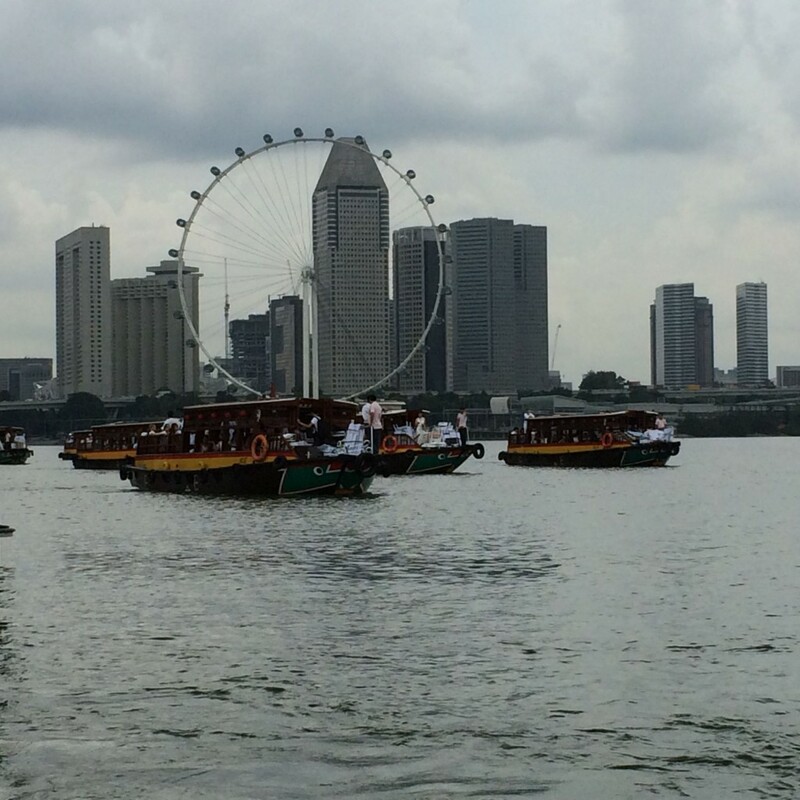 I nearly got tickets, but got put off by the huge amount of effort involved, including having to pick up a table from Changi. Sounds fun though! You looked stunning in that jumpsuit…LOVE IT. 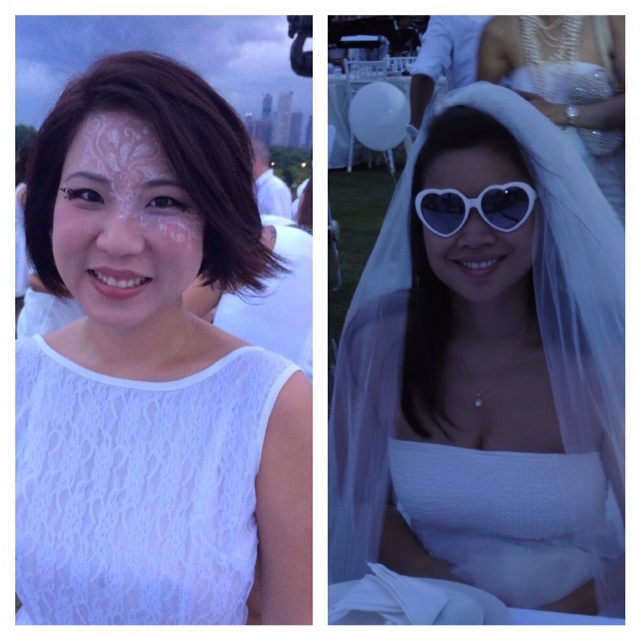 Sad I couldn’t make DEB – on the plus side, I didn’t have to rush out to find a white dress!